Howdy folks! I'm posting lightly lately, and just as a reminder of where you can check out some of my other work, be sure to check in on Oshawhat.ca, where I'm a regular contributor. Recently a coworker and I had the opportunity to travel for work to Hamilton, to the Art Gallery of Hamilton, as well as to Buffalo, NY, to the Albright Knox Art Gallery. I was really looking forward to it because the Albright Knox is one of my very favourite places I've ever been, and it has been close to ten years since I last visited, to see a James Tissot exhibition. We started out our morning in Hamilton, and were able to see a bit of the gallery after our meeting. 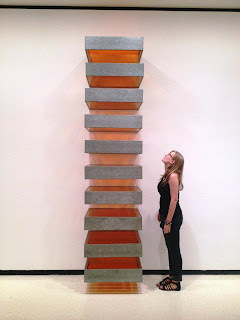 I was interested in the sculptural works of Valérie Blass, who is a sculptor from Montreal. Her sculptural works are confusing and complex, funny and bizarre. 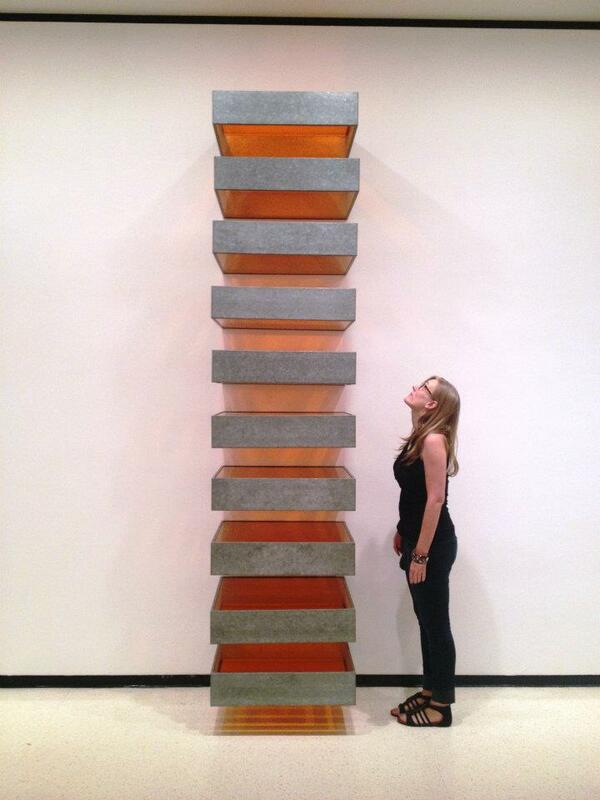 They are often compared to Duchamp, but instead of being ready-made, they are crafted largely from found objects. Here's a review of the exhibition, which closes September 23. After Hamilton, we took the QEW down to Fort Erie, and crossed over to Buffalo. Buffalo NY is the second most populous city in New York State after New York City, with a population of 261,000 in the city and 1.2 million in the greater Buffalo area. In 1900, it was the 8th largest city in the United States and was a major railroad hub. After WWII, Buffalo was at a peak of prosperity as it was a manufacturing centre, with a peak population of almost 600,000 residents. But, after a number of economic set backs, including the re-routing of shipping and train routes, Buffalo's population has dwindled back to pre-1900 numbers. 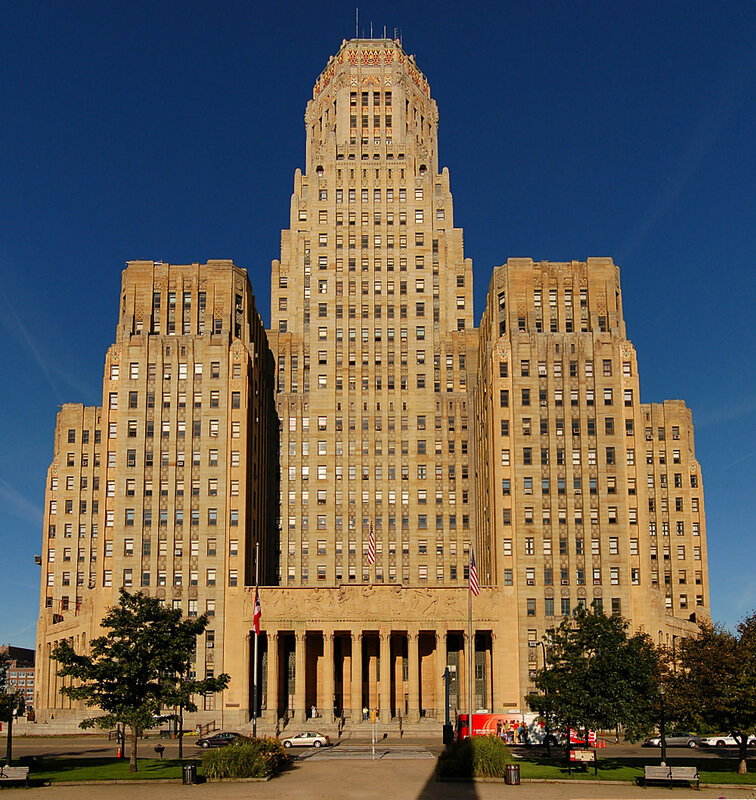 We had to pass by the truly impressive and imposing Buffalo City Hall. The art deco building was completed in 1931 and is one of the largest municipal buildings in America. Up Delaware Avenue we traveled, to stop in at our Hotel before carrying on to the Albright-Knox Art Gallery. Founded officially in 1862, as the Buffalo Fine Arts Academy, it is one of the oldest art institutions in America. Over the years, supporters John J. Albright and later, Seymour H. Knox had influence and as donors, helped create the institution the AK is today. With a focus on collecting modern and contemporary art, the AK has an extraordinary collection, with works by blockbuster names such as Pablo Picasso, Chuck Close, Ray Lichtenstein, Frida Kahlo, Andy Warhol, and many more. 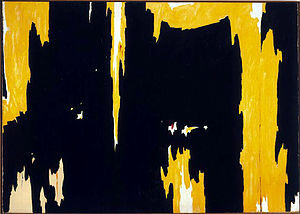 I was taken by the installation of works by Clyfford Still. Still was an American painter and leader in the Abstract Expressionist movement. His paintings are monumentally large, featuring swatches of colour that look almost ripped across the canvas. The AK has a significant collection of 31 of his works. Pictured is his work 1957-D.
We were also able to check out the exhibition Wish you were here: Buffalo Avant Garde of the 1970's which is a survey of the creative scene of Buffalo in the 1970's. My favourite work was one by Cindy Sherman, who is a photographer who is best known for her conceptual self-portraits. She raises questions about women's role in society and uses props, costumes and prosthetic body parts to change her look in image to image. I've always found her work fascinating, and learned a lot about her connection to Buffalo in this exhibition. For dinner we went to Gabriel's Gate. And had buffalo wings, of course. The joint came recommended to us by our hotel concierge who said the 'famous' Anchor Bar was over rated. The wings were good...truth told I'm not sure what it would take to create a truly mind-blowing chicken wing. The next day, the Allentown Art Festival was happening right outside of our hotel, but it was absolutely a torrential downpour, so we skipped that and did some indoor shopping instead, before heading home. Buffalo is an interesting city, with stunning upscale historic properties a block away from deserted factories. In that sense, it reminds me of Detroit or Hamilton. These manufacturing cities are forced to re-invent themselves as their populations suffer the worst hits in the economic shifts of manufacturing economies. To that end, their arts and culture scenes thrive, and there is plenty to see and do. 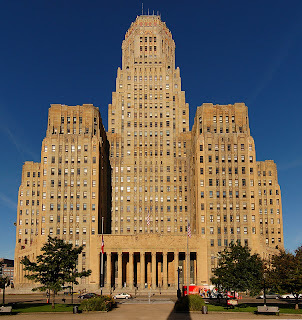 I will be heading back to Buffalo again soon, to check out the Burchfield Penny Art Centre, revisit the A-K, and to spend a bit more time discovering the colourful neighbourhoods of Allentown and the Delaware Avenue Historic District, as well as the Frank Lloyd Wright Martin House. Article from Buffalo News "The Whole Truth about the Buffalo Avant Garde Scene"